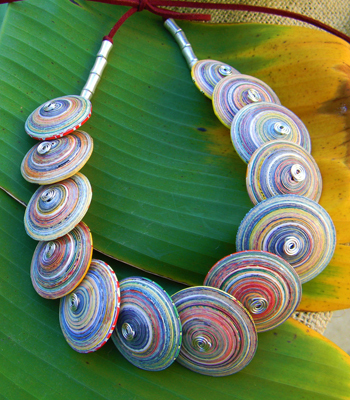 Each of the tightly coiled paper buttons is a work of master paper bead makers from the Philippines. Swirls of colors from the magazine pages create what looks like tree rings only in color. I made them into buttons by attaching it into coiled wire and making a loop on the other side of the button just like a button. This is a substantial piece and it is not for the faint of heart! It reminds me of something that Cleopatra would wear, I wonder if someone thought of making paper beads out of papyrus back then? 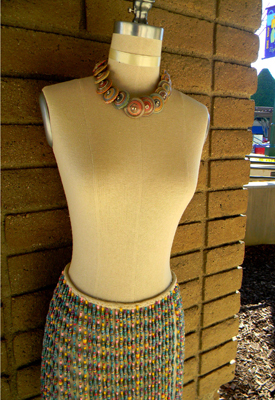 i am looking for directions on how to make the saucer beads and the small round beads. i have purchased both starter kits from JTV along with the 3 cocoons and a bag of paper beads. please tell me where i should look for the patterns to make these beads along with a few others. i think a kit with those patterns would be a huge hit with JTV customers. have a wonderful Thanksgiving!!!! oh! 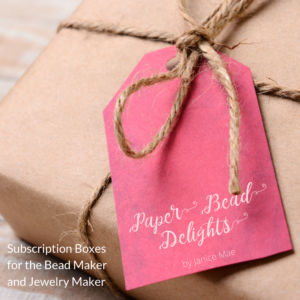 I love these paper beads ….! they are my favorite! 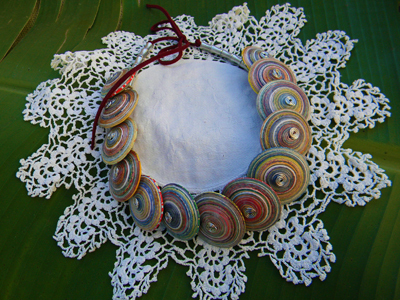 I still can not find the right paper to make such pretty shades of colors in my saucer shape beads, but I persist! 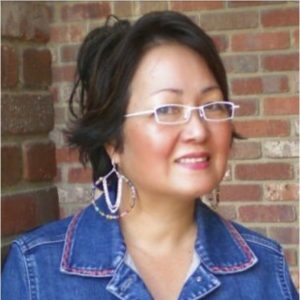 I love this necklace … it is a success! Wow, this is bold. I think it’s a wonderful way to use the large discs. It really makes a statement. I love love love this ! what an idea you had !! wonderful ! Oh my, how beautiful that is!!! I would love one day to be able to make this. The colors are exquisite and the necklace is amazing.